I am sure many would agree with me that a lot of people both old and young alike sit on brilliant ideas every day. It is not so much as the ideas are not worthy of implementation but also that sometimes, there’s a certain push lacking to see these ideas come into fruition. Some may range from lack of time, will power or the absence of money and possible mentors. I cannot count the number of times I have mentally written books which I sometimes wished there was a way to just blow all those ideas into papers and present them to a publisher. Yet, again and again, I wake up starring at the blank sheet on my paper. Excuses though justifiable as they may sound in my ears, are not going to write those many mental books for me. 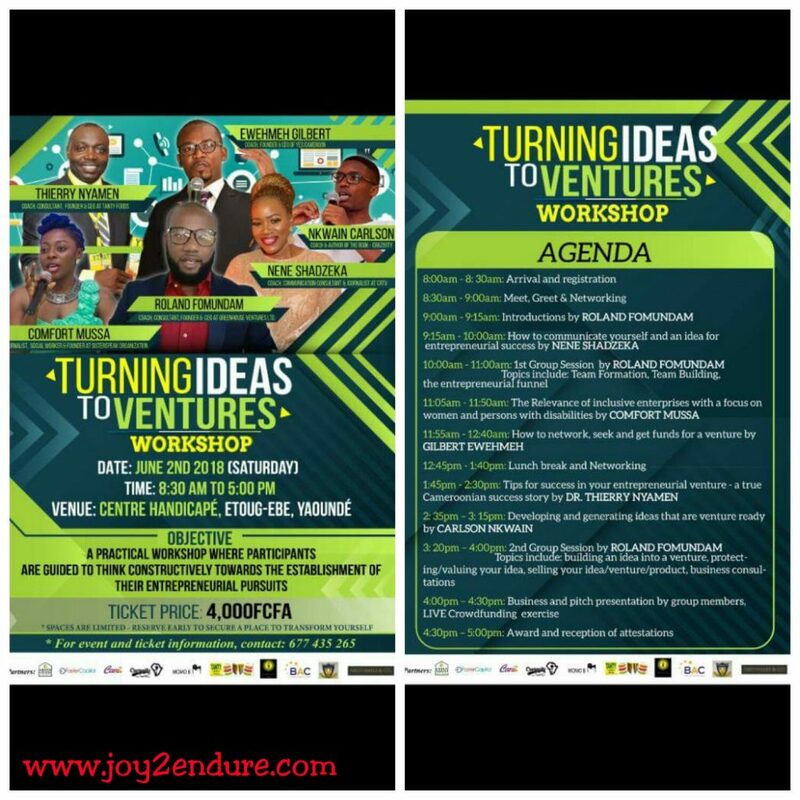 Therefore, it was thrilling to be able to attend the first two series of the much talked about Turning Ideas to Ventures organized by a few dynamic young Cameroonians determined to change the game and push the youths to be productive and active people in charge of their lives; amongst the organizers are Mr Roland Fomundam of famed Green House Ventures and Mr Carlson Nkwain, author of the must read book Crazyvity. 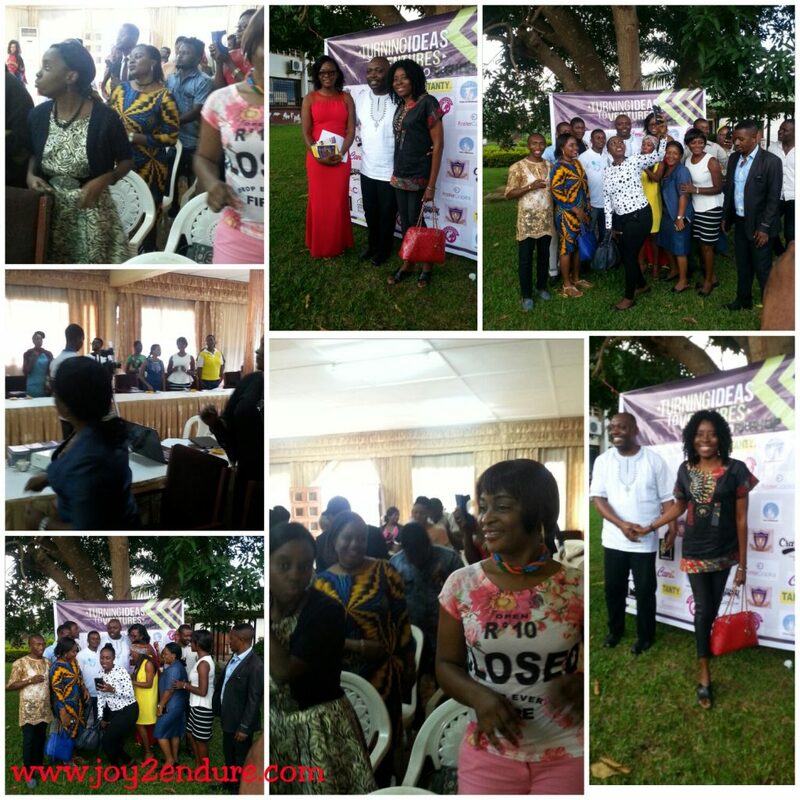 The workshop was launched at the Chariot Hotel, Buea on the 5 and 6th of May, 2018. I was present, but not fully involved in this first workshop because at the most, I was lost in translation. 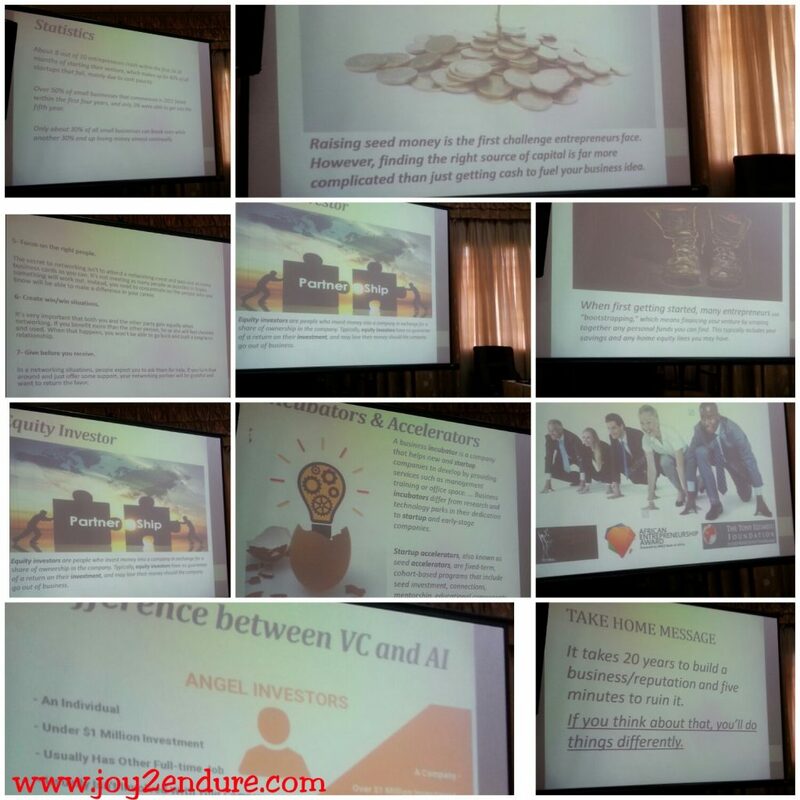 Nevertheless, after the introduction and welcome address by Mr Roland, the workshop gathered steam as speaker after speaker came to talk about ways to turn ideas into ventures. Two outstanding speakers on day two were Ms Nina Ngassa of famed Nina’s Slow Boys. 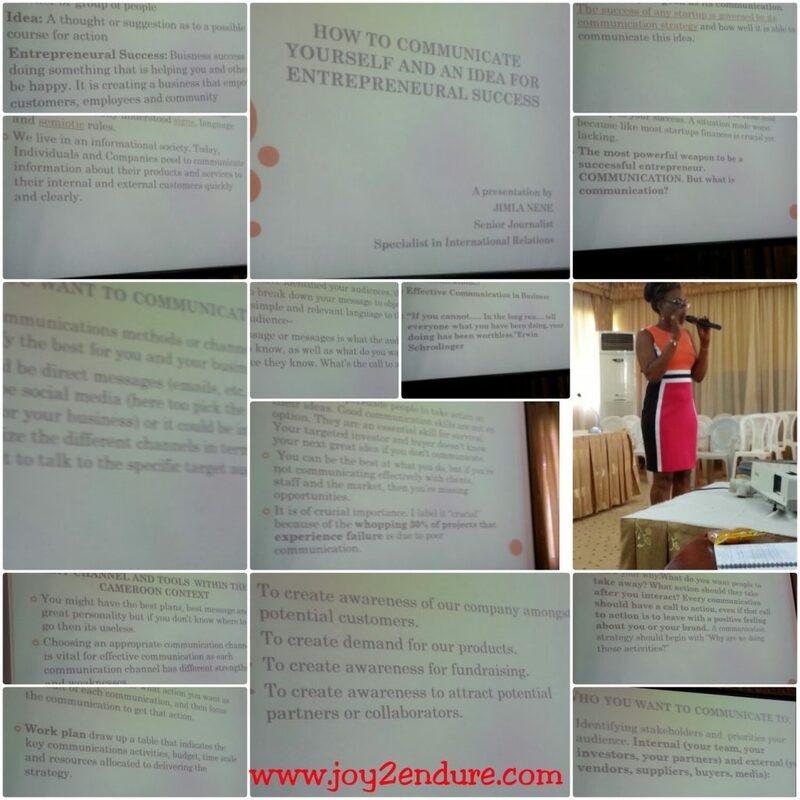 She shared her story and her theme was focused on how one can start a business with ‘just’ 100 thousand F CFA. Granted, the just 100 thousand raised some eyebrows especially if we consider the fact that it is not a small amount to the average Cameroonian. Nonetheless, if we looked at her target audience, we would understand the rationale behind the ‘just’. Another speaker, Ms Anrette Ngafor; motivational speaker & fitness coach, educator and CEO of the renowned fashion brand, Liiber London handled the angle of using your talents to the full and still be happy. It was impressive to see a lot of youths forgo their weekend activities to attend this workshop, a testament to the fact that youths are sorely in need of mentorship and knowledge. 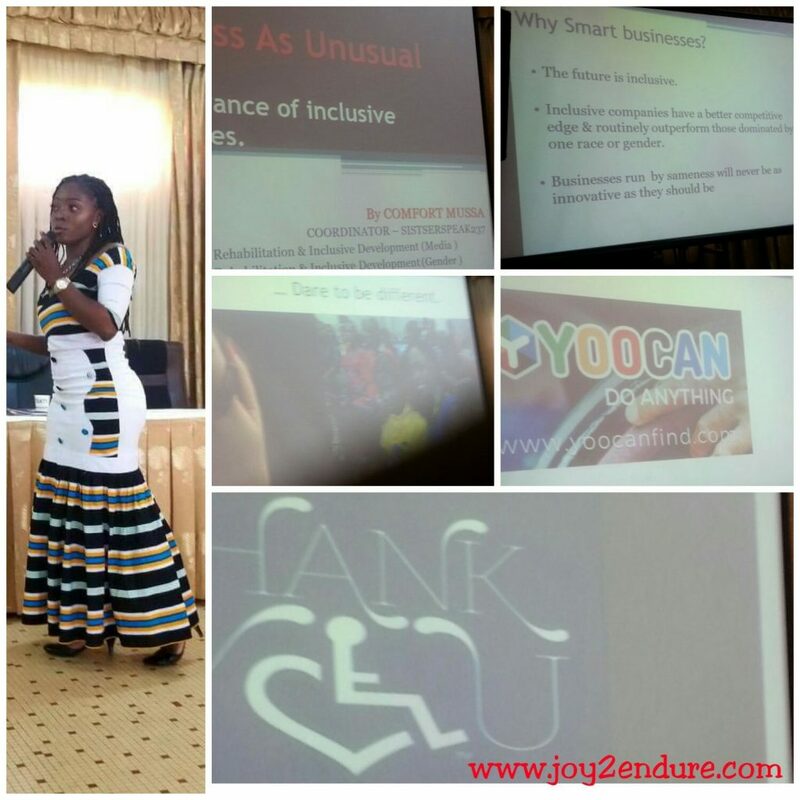 The second phase of the workshop which took place in Yaoundé over the weekend of June 2nd, at the Etoug’ebe handicap centre was an enriching experience and a Saturday well spent. Mr Roland, again welcomed the participants and placed emphasis on punctuality. The typical Cameroon time was very much alive this day as many came late, causing the workshop to start and finish a few hours later. 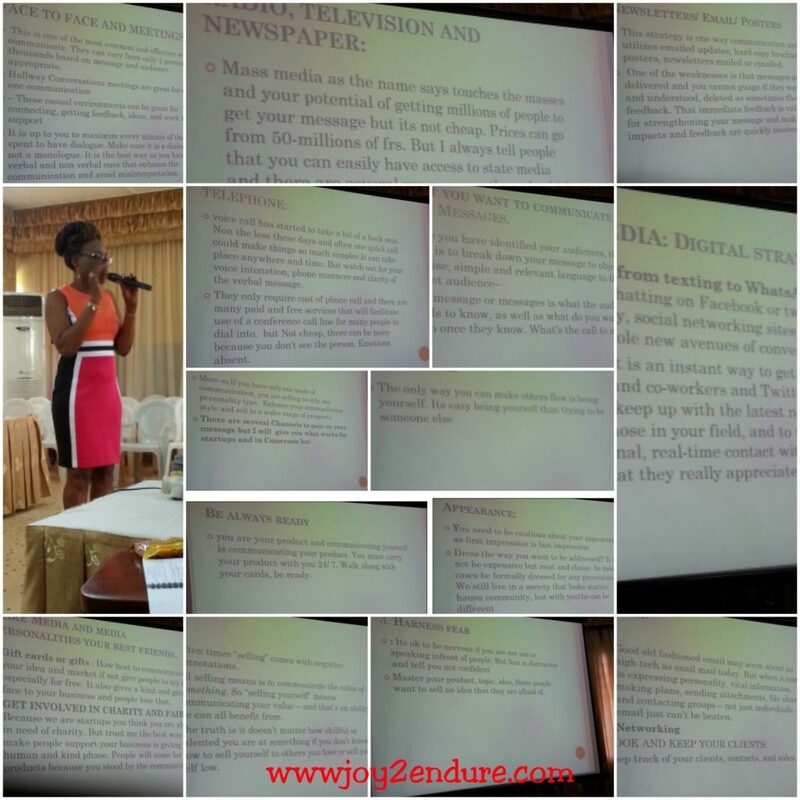 Ms Jimla Nene, a senior journalist of the Cameroon Radio and Television (CRTV) was the first speaker and she stressed on the importance of effective communication in selling our ideas since they have a great role to play in attaining our goals. People do not always know our ideas so we need to put a human face to it. The ways this can be achieved were through publicizing our ideas, being able to pitch our ideas to the right audience by using best possible choice of words. She also stressed the importance of give and take… a win-win for all involved. Personal branding is also very important and your appearance and being able to use effectively the different modes of communication to sell your brand will go a long way. She stayed true to her profession as she spoke at length lol. However, her discourse was engaging and feedback from audience was great. I so love the bottom picture. It is all about inclusiveness. The second speaker was Ms Commy Mussa journalist and disabled rights activist extraordinaire. 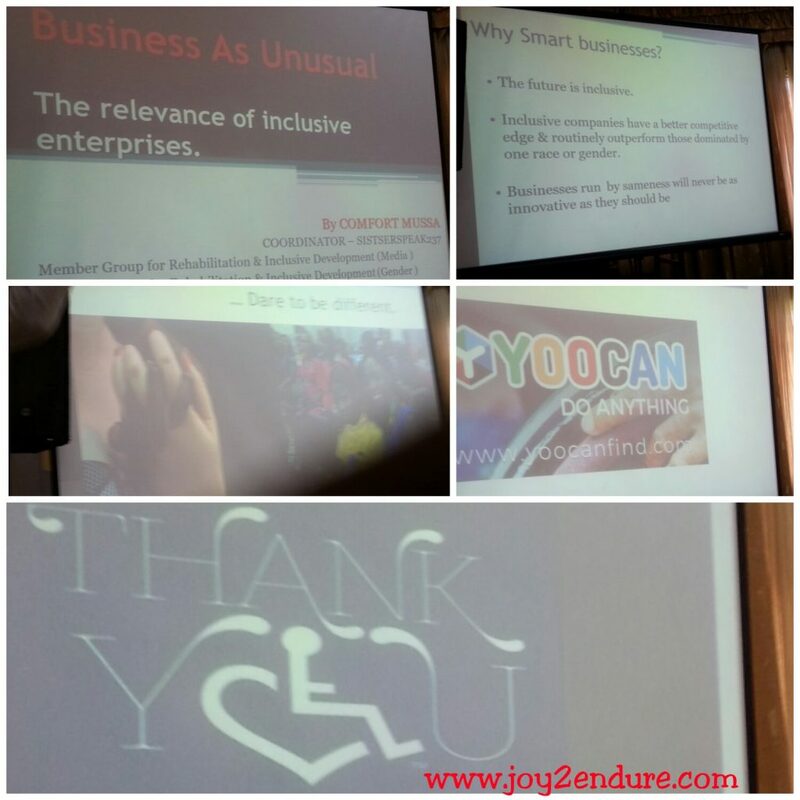 She developed the theme of ‘Business Unusual’ which placed emphasis on inclusiveness of people with disabilities. The importance of including people with disabilities on every sphere of the society from thinking accommodations, education or employment could not have been overemphasized. Any society willing to grow has to start including persons with disability because the future growth of any society is based on inclusiveness. Lack of inclusion deprives persons with disabilities of opportunities and the chance to reach their full potentials and to be useful members of the society. Citing examples from countries like Israel and the U.S.A., she showed how inclusiveness benefits a society. Cameroon is trying but, they still need to step up their game. I thoroughly enjoyed her discourse thanks to the sign language interpreter; to the extent that I joined the audience during discussion to say a few choice words on how deprivation of persons with disabilities cheats the society at large. It was thrilling to listen to the audience and see how many had changed perceptions towards persons with disabilities. The future really is inclusive. The third speaker was rushed and even the sign interpreter got lost in translation. Weda yi be di hurry for go wosai oh! I will let the pictures speak for him. The last picture on the right. If you have never eaten our local food for breakfast, you are missing! The stage was now given to Dr Thierry Nyamen of TANTY. His was an inspiring story… the typical example of a grass to grace kind of story. Returning home from the U.S. with a PhD in Agriculture and processing and selling groundnuts amongst others on the streets, he was mocked at. Needless to say, the mocking served as fuel which propelled his determination to reach his goals. Today, from humble beginnings, without listening to the naysayers and losing sight of his goals, he has succeeded to build a brand name Cameroonians should be proud of. What really got me was the fact that he has remained a very humble man. He employs and opens his doors to youths seeking to better them through internships. My take home lesson was this: Be true to your goals, stay humble, do not listen to naysayers because they will always be there and certainly, do not despise the days of humble beginnings. Start small, think big, dare to get out of your comfort zone. See solutions were others see problems and road blocks. His products are done over the most hygienic and organic ways. I am now a fan and will be looking out for TANTY brands in any of our shops and supermarkets henceforth. 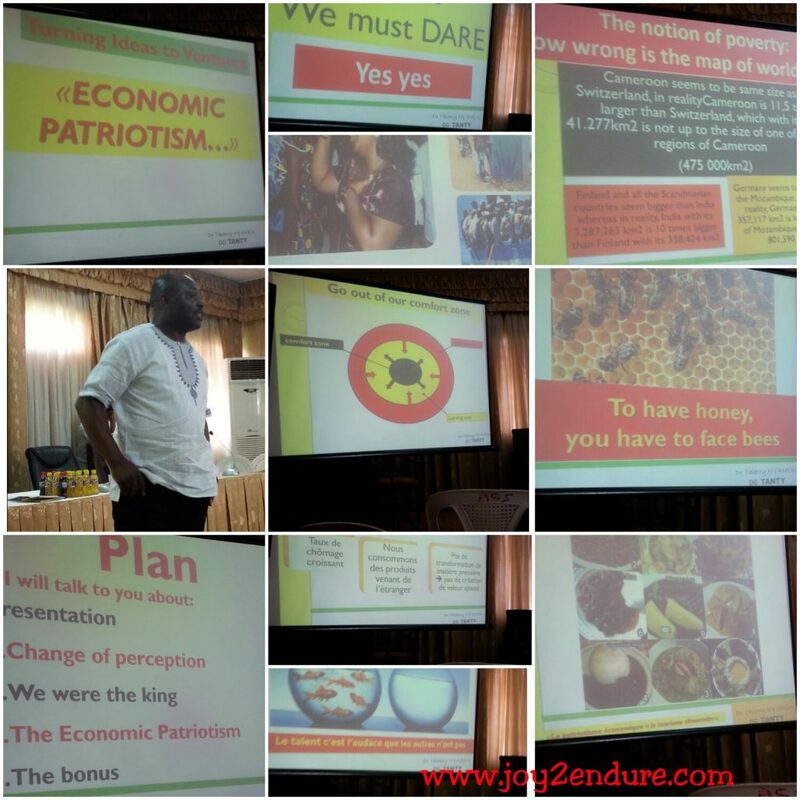 ‘Economic Patriotism’ Consume Camer… Tanty for the win! Carl was the next person to talk. 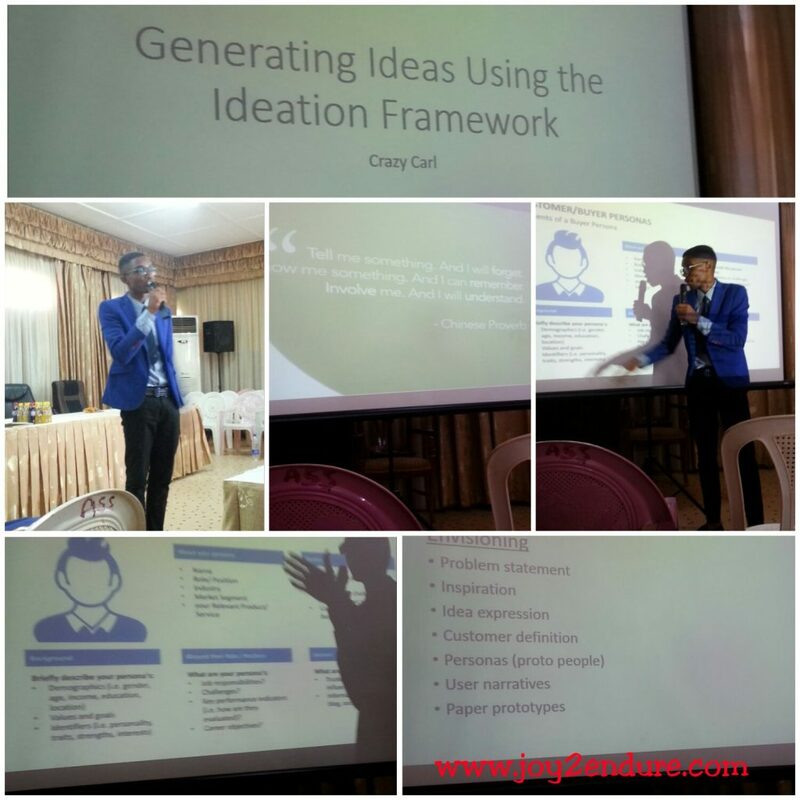 He spoke on building ideas on ideation. Weti be ideation sef eh? Oh no worries, he’s crazy like that that’s why he comes up with such crazy ideas but guess what? He is crazy in a beautiful way. His craziness gets things done because he believes in these two words: Innovate or die! And to innovate, you must have some crazyivity in you and be willing to stay crazy. Roland summed up the workshop, capitalizing on the points discussed so far. Roland is one determined change maker whose works speak for him, so we need not talk much here but hey, let’s give him some accolades for his relentless drive to impact young Cameroonians especially positively. More of his work could be found in his Facebook page. 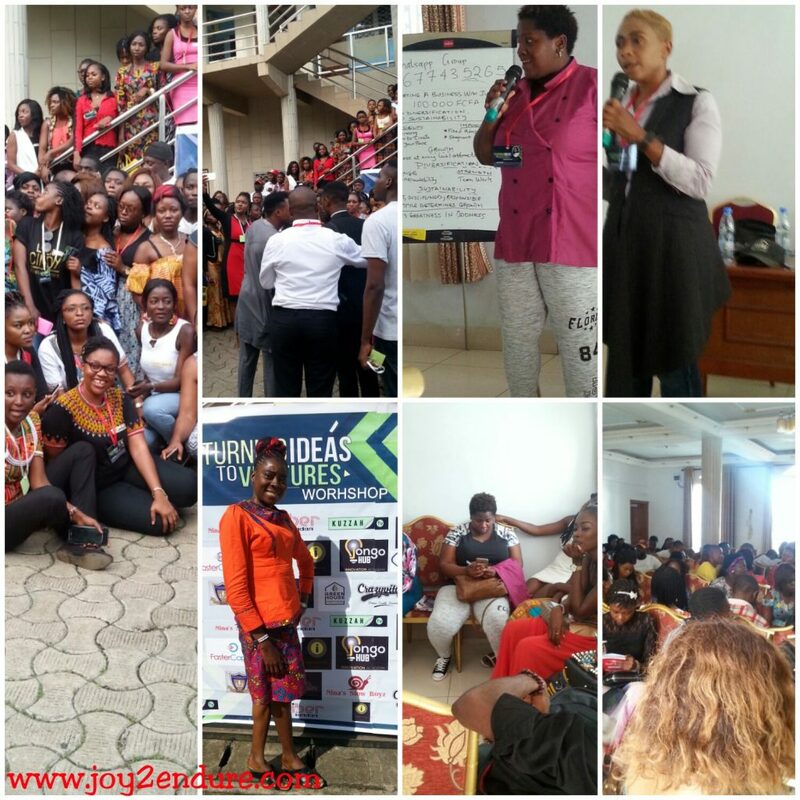 Participants were divided into groups with the goal of producing an idea that would be turned into ventures. Mr Christian, the sign language interpreter. He helped make the workshop enjoyable for me. 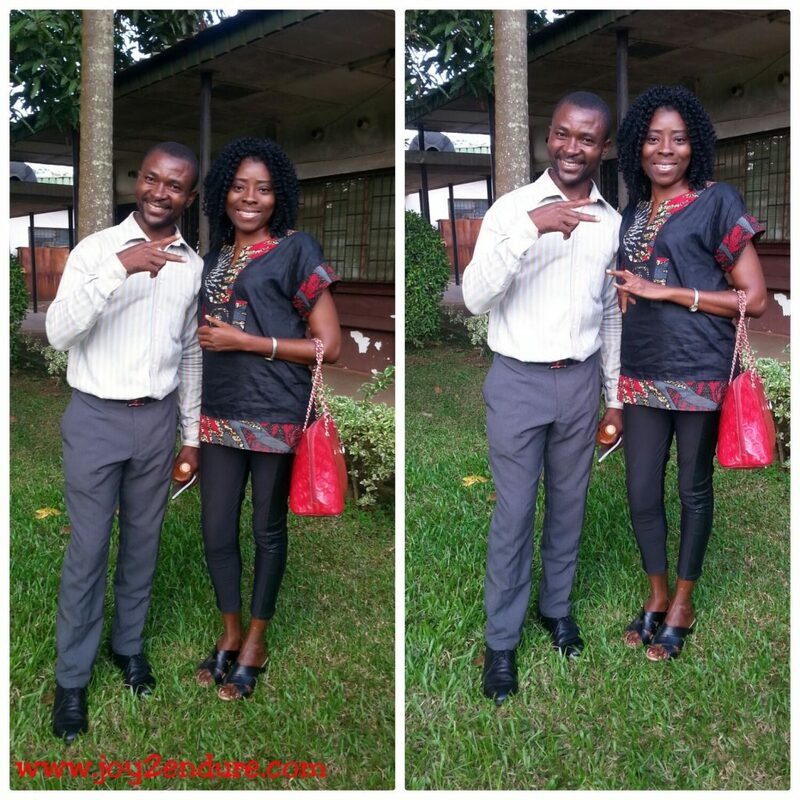 He is fluent in French and British sign languages while I am in American Sign language but we survived… here, he’s making the victory sign while I am signing the ‘I love you’ sign. The inclusion of the sign language interpreter was a welcomed addition and a marked improvement on the efforts of organizers to be inclusive. My wish is that others organizing such workshops would take a leaf off this and start doing inclusiveness in their workshops. Respect of time still remained a factor which should be considered in subsequent workshops. Family photo with some participants in Yaounde. The two workshops had a record attendance of almost 300. That indeed is an indication of just how much importance such workshops hold in our society today and the good thing is, many are not just going in to pass time. There are serious people there seriously taking notes. 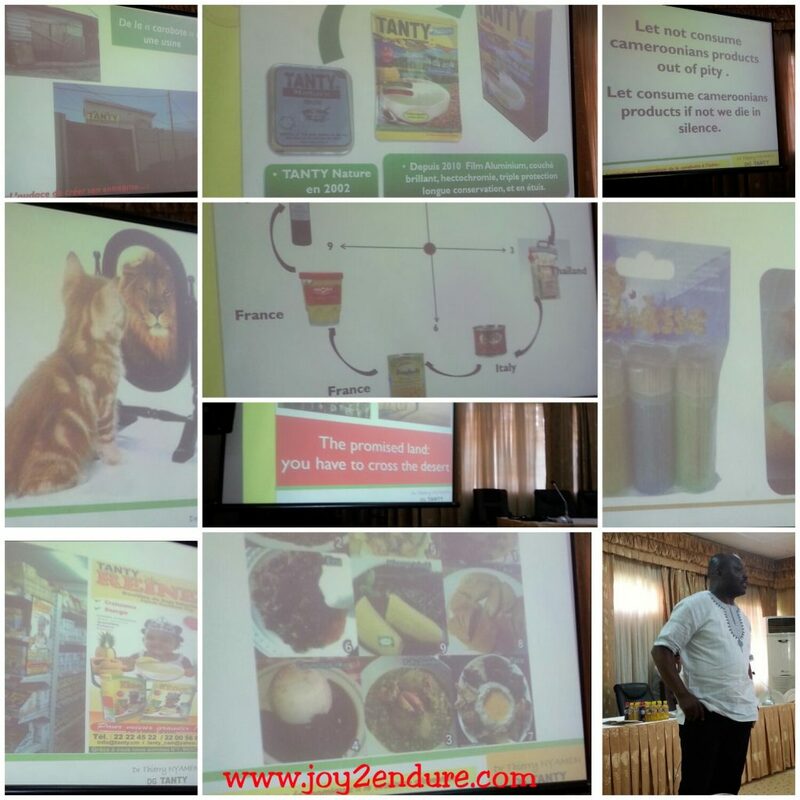 A case in point, a participant’s of the first workshop’s products in Buea were on display at the Yaounde workshop… a testament to the impact these workshops are having. 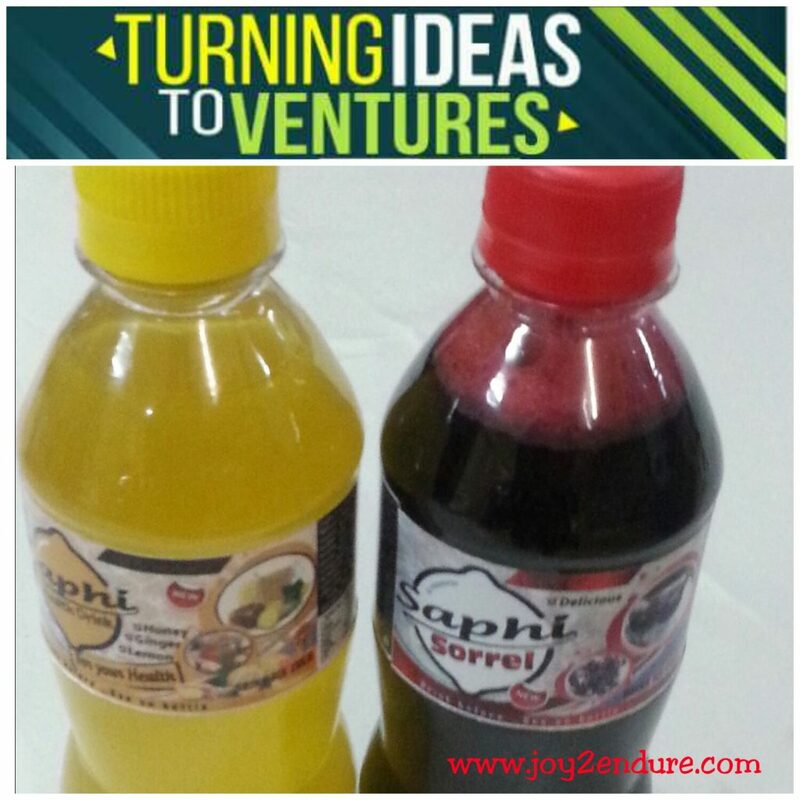 Watch out for bottled Folere and other locally made drinks in our shops soon. 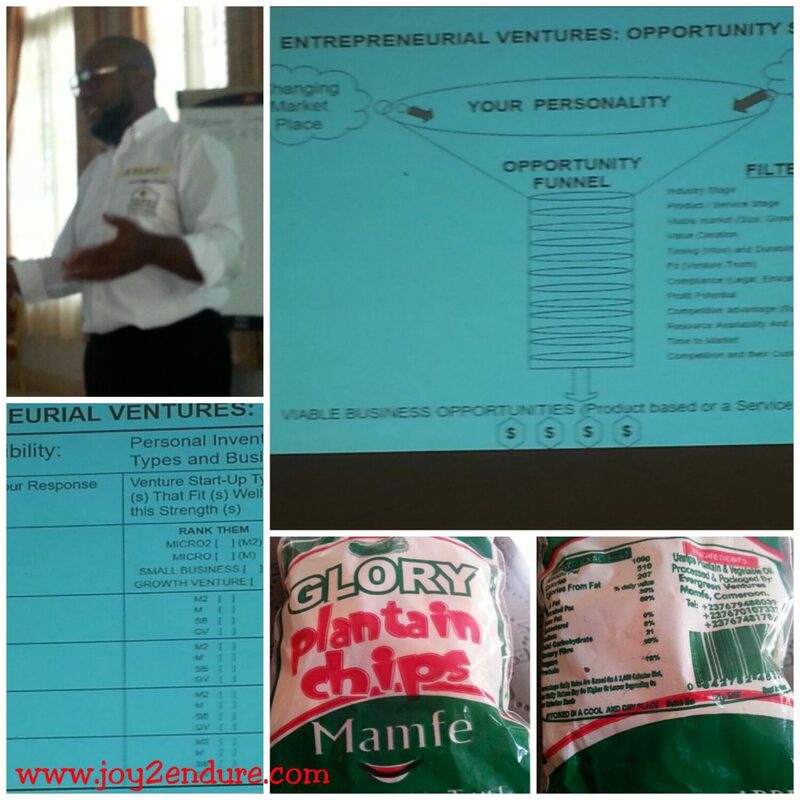 Product of a participant of the maiden workshop in Buea. Certificates of participation were awarded to all participants. I have attended twice with two certificates to show and of course, with more sharpened desire to turn my ideas into productive ventures. Like this recap? Leave a comment and tell us what you think, thank you. Thank you for the Beautiful recap Arrey. I couldn’t have put it as good as this. Hey Crazy Carl, thank you for stopping by and for the kind words. It was a learning moment in time.